Duncan Hewitt at the plate for Butler. The Bulldogs are now 17-12 on the season. Jimmy Lafakis/Collegian file photo. 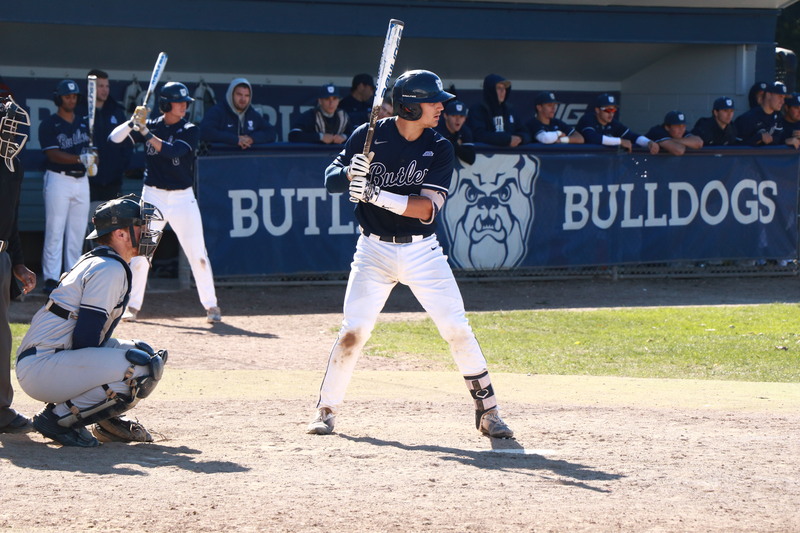 Big East baseball play kicked off around the country this past weekend and the schedulers did not give Butler any time to get comfortable in league play. First up on the ledger was the preseason unanimous favorite to win the conference, St. John’s. The Bulldogs fell in the opening game of the series 4-1 behind Joe LaSorsa’s gem. He pitched seven innings and struck out seven, giving up only one hit and no earned runs in the process. James Gargano scored the lone run for the Bulldogs in the bottom of the sixth off a wild pitch. That cut the Butler deficit to just 3-1, but St. John’s answered with a run in the seventh. Joe Kelley picked up the save for St. John’s. Jack Myers ate up 5.1 innings in relief for the Bulldogs. For the pitchers’ duel that was on Friday, the first game on Saturday was anything but that. The Bulldogs pulled off an 11-7 victory over the Johnnies behind a monster game from Harrison Freed. The junior hit a grand slam in the bottom of the second inning, giving the Bulldogs an early 6-1 advantage. The Red Storm were not going away that easy, though, as a four-run fourth inning tied the game up at six. So it took another home run from Freed, this one a three-run shot to give Butler back the lead in the sixth inning, 9-6. Freed finished the day with seven RBIs, pushing his team-best mark to 40 on the season. Freshman Alex Voss earned the win by finishing out the final 5.2 innings of the first game on Saturday. The two teams were able to begin the second game of the doubleheader, but the setting sun did not allow the teams to finish on Saturday. The teams returned Sunday to “start” the game at the top of the tenth inning, knotted up at four. A throwing error from the Bulldogs scored the winning run for St. John’s. Butler now stands at 17-12 on the season and 1-2 in conference play. The Bulldogs will next travel to Muncie, Indiana on Tuesday to face off against in-state foe Ball State. First pitch is scheduled for 3 p.m.